MarkDaniels.Blogspot.com: "Your faith has made you well"
I hope that the answer to that question is obvious. After all, Jesus Himself, sinless, completely trusting in the other two persons of the Holy Trinity--God the Father and God the Son--nonetheless suffered more than any of us ever has or ever will. Completely innocent of sin, Jesus, true God and true man, suffered and died for the sins of the world. In Matthew 5:45, Jesus says: “[God] causes his sun to rise on the evil and the good, and sends rain on the righteous and the unrighteous.” You and I have all known faithful people--people who trusted their whole lives to the God we know in Jesus--who suffered, some dying at young ages despite their uncompromising faith. And often people encounter suffering--persecution, shunning, and death--not in spite of, but because of their faith in Jesus Christ. Faith in Christ is no insurance policy against suffering in this fallen world. To understand what Jesus means in the final verse of our lesson--”Rise and go; your faith has made you well”--we need to look at the entire incident recounted in the lesson. Jesus passes between His native Galilee and the country of Samaria. The Samaritans, you know, were disdained by Jesus' fellow Jews. They hated the Samaritans in the way only family members can hate each other. The history was that after the death of King Solomon, God's people divided into two separate nations: Judea to the south (with which Galilee was connected) and Samaria to the north. The Judeans would have argued that while their land had often been guilty of idolatry, Samaria was even worse. In some ways, they had a point. The Samaritans had intermarried, adulterating and syncretizing Old Testament faith. To the Jews, Samaritans were low lives. In those days, when people had leprosy, they were forced to live in isolation from family, friends, and neighbors in colonies on the edges of towns. No one touched them. They were forbidden to touch anyone else. That’s why the lepers had to call Jesus from afar. To Jesus’ Jewish contemporaries, lepers wouldn’t have been regarded as prime candidates for the attention of a holy God! They likely would have completely ignored them, the way we human beings often ignore other human beings in our world who have great need. And the people Jesus encounters here were Samaritan lepers, the worst of the worst. Go to verse 13, please: “...and [the lepers] called out in a loud voice, ‘Jesus, Master, have pity on us!’" In desperation, the lepers called out to Jesus. They seek something no one else is giving to them: mercy. Our willingness to hear the cries of those around us for mercy is one measure of the presence of Jesus in our lives. And it is precisely here that we human beings can often be found wanting. 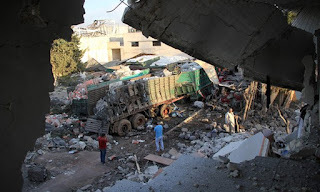 In recent weeks, my heart has been wrenched by the plight of the Syrian people, victims of constant bombing and attacks, including assaults on an aid convoy heading for Aleppo, under the direction of two thugs--Vladimir Putin and Basher al-Assad--and the world is doing nothing. If you and I were filled with the mercy for others that Jesus has given to us, wouldn't we work tirelessly to convince our own government and the members of the United Nations to put a stop to this? 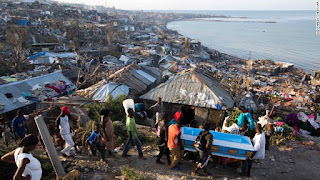 And as I look at what has happened in Haiti, a country with almost no infrastructure and a corrupt government, in the wake of Hurricane Matthew, I pray that we will all be filled with sufficient Christian mercy to pray for and give to providing Haitians comfort and relief. As Jesus has been merciful to us, we’re to be merciful to others. 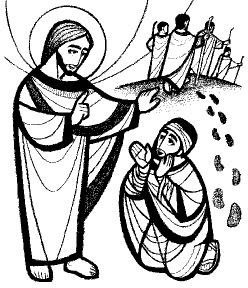 Verse 14: “When [Jesus] saw them, he said, ‘Go, show yourselves to the priests.’ And as they went, they were cleansed." Old Testament law said that once a priest certified that a person had been cleansed of their leprosy, they could return to their homes. Jesus instructs the ten lepers to see priests. Even as they went, their leprosy disappeared. It’s hard to imagine how the ten of them must have felt at that moment. Their earthly lives had been changed by the compassion of God, given in Jesus Christ. When our children were growing up, we explained that we prayed to thank God before eating because, as Martin Luther said, people who don't thank God are pigs, just gobbling up God's blessings as though they were theirs by divine right. Our kids remembered this. If for some reason we forgot to pray, one of them inevitably would throw up their hands and say, "We're pigs!" Then we would give thanks. Not every beneficiary of God’s mercy acknowledges all that God has done for them. They just go on with their lives as though goodness and blessings from God are things to which they’re entitled. But none of us is entitled to anything from God. Life itself is an undeserved gift! Every good thing added to it is gravy. Often though, I’ve seen that people who have been helped by God through extraordinary circumstances, evidence no gratitude to God. They seem unable to admit their vulnerability or their need of God’s help. Maybe this is why only one of the ten cleansed lepers returned to give Jesus thanks. The other nine didn’t want to even think about how weak and helpless they had been. The fact is, we are all weak and helpless. We all need God’s help. The truth is, you never can tell who is going to respond to Jesus Christ. Nor can you know when or how they will respond. That’s why we as Christ’s disciples, individually and as a congregation, must remain resolute in sharing the good news of new, everlasting life for all who repent and believe in Jesus Christ. If, as we share the good news of Jesus with others, nine out of ten people reject the message, so be it. Our call is to simply keep on sharing Christ, keep making disciples. Then, Jesus says to the one thankful man in verse 19, “Rise and go; your faith has made you well." We know that ten people had been made physically well and we don’t know that they had much in the way of trust in Jesus beyond what they’d heard about his ability to perform miracles. But, I don’t think that Jesus is talking about people being physically well here. Jesus didn’t suddenly revoke the healing He had given the other nine because only one man displayed gratitude. So, here’s the key fact in this passage: All ten were physically healed, but only one was made well. And a person can be physically or psychologically or emotionally broken down, but still be well! The New Testament, of course, was written in Greek. And the root verb of the word translated as “has made you well” is, in Greek, sozo. What Jesus really says, "Your faith has saved you." The grateful man was well because he had been saved. The person dying on a hospital gurney can, even as they die, know: “It is well with my soul!” They know that they are just as saved as the healed leper was at the moment Jesus declared that his faith had made him well! Even at the point of death, it’s possible for us to live in the certainty that nothing can separate us from the love of God given in Jesus Christ. When we entrust our lives to Christ, we are saved. How? How can we know that? By faith! By faith, he fell at Jesus’ feet and worshiped. By God’s grace, he had been saved by his faith in Jesus Christ. He could live his life on earth in confidence and hope and joy; through Christ, he was saved--eternally saved--for a life with God that never ends. We cannot be saved by habits or political action. We can't be saved by caving into the warped values of a world out of sync with God. We won't be saved by our personally preferred interpretations of Scripture or by our love, which is only a faint and sin-tinged echo of the perfect love of God. We can't be saved by our morality, by being good, or by obeying the rules. It is Jesus Christ and Jesus Christ alone who saves us from sin, death, and futility. We can bet our lives on those words. More to the point, we can bet our lives for all eternity on Jesus.